Gossaye Rocks New York City! Despite the cold weather and strong winds, fans of Gossaye stood on line to see ‘the Golden Voice of Ethiopia’ perform at SOB’s. Gossaye, who is on a 10 U.S. City tour and had just finished performing at Dallas Texas on New Year’s Eve, sang for a live New York City audience. The crowd at SOB’s cheered when Gossaye took the stage and sung along to several of his hits. Born in Addis Ababa, the capital of Ethiopia, Gossaye easily sang his way into the hearts of the women in the audience, some of whom could not resist but to dance on stage with this heartthrob. During his performance, Gossaye was very welcoming and engaged the audience. According to www.gossayetesfaye.com, Gossaye’s singing career started during his high school days when he used to sing and entertain fellow students as a member of a music group. His singing career continued as he made a name for himself playing in night clubs of Addis Ababa. 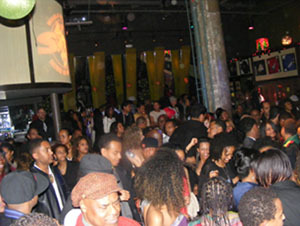 But on the night of January 4th 2008, it was the famous New York City club SOB’s he was Rocking! Next Topic: Yesterday’s Dream, Today’s Reality?